Climbing profile of Col de la Croix Fry from Saint Jean de Sixt. Climbing profile of Col de la Croix Fry from Saint Jean de Sixt. Col de la Croix Fry, at an altitude of 1467m, is in the Aravis region of the Northern. It links the village of La Clusaz to the valley of the river Fier and the village of Manigod. 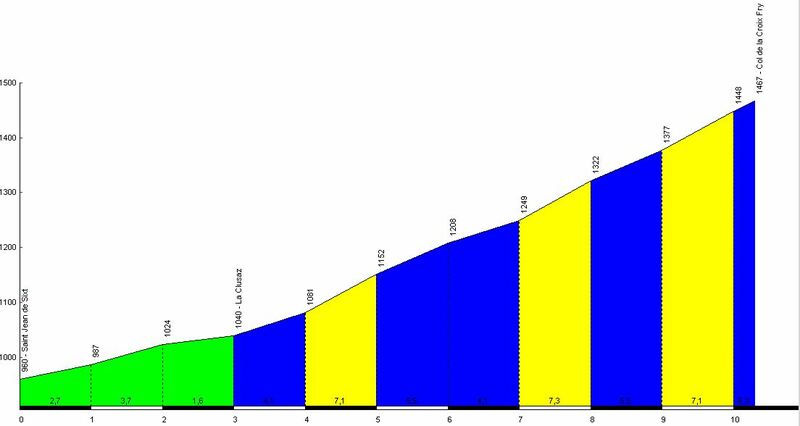 The first part of the climb is a gentle climb to the village of La Clusaz and is shared with the climb to the Col des Aravis. Approximately 4km beyond the village, the road forks off to the right from the Aravis climb. The road climbs steeply past some ski lifts before a sharp hairpin to the right enters a forest. Thereafter the gradient averages 7% all the way to the summit. The Col de la Croix Fry has been climbed four times by the Tour de France, most recently in 2013 where Rui Costa rode to victory in the pouring rain. We've been here for nearly 15 years and can help with all aspects of planning your biking holiday.